Steroid Glycosides Book from C.H.I.P.S. 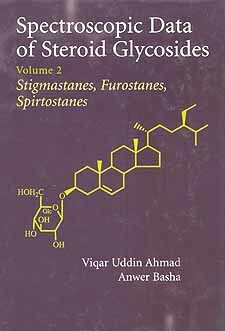 Spectroscopic Data of Steroid Glycosides serves as an essential reference guide containing spectroscopic, physical and biological activity data of over 3500 steroid glycosides, offering the structures and the data of the naturally occurring glycosides of steroids. All compounds are arranged according to the structure of the aglycone, and, in its own class, according to the increasing molecular weight, making Spectroscopic Data of Steroid Glycosides extremely useful for the structure elucidation of new natural products, particularly glycosides. Spectroscopic Data of Steroid Glycosides offers a practical desk reference for all scientists and students interested in steroid glycosides and their biological and medicinal importance. Source, name of the genus, species, authors, family of the biological source from which the glycoside has been isolated.